Walt Whitman was born on May 31, 1819, in West Hills, Long Island, the second of nine children. His family soon moved to Brooklyn, where he attended school for a few years. Young Whitman took to reading at an early age. By 1830 his formal education was over, and for the next five years he learned the printing trade. For about five years, beginning in 1836, he taught school on Long Island; during this time he also founded the weekly newspaper Long-Islander. By 1841 Whitman was in New York City, where his interests turned to journalism. His short stories and poetry of this period were indistinguishable from the popular work of the day, as was his first novel, Franklin Evans, or the Inebriate (1842). For the next few years Whitman edited several newspapers and contributed to others. He was dismissed from the Brooklyn Eagle because of political differences with the owner. In 1848 he traveled south and for three months worked for the New Orleans Crescent. The sheer physical beauty of the new nation made a vivid impression on him, and he was to draw on this experience in his later poetry. Not much is known of Whitman's literary activities that can account for his sudden transformation (change) from journalist and hack writer into revolutionary poet. The first edition of Leaves of Grass (1855) opened with a rather casual portrait of Whitman, the self-professed "poet of the people," dressed in workman's clothes. In a lengthy preface Whitman announced that his poetry would celebrate the greatness of the new nation—"The Americans of all nations at any time upon the earth have probably the fullest poetical nature. The United States themselves are essentially the greatest poem"—and of its peoples—"The largeness of nature or the nation were monstrous without a corresponding largeness and generosity of the spirit of the citizen." Of the twelve poems (the titles were added later), "Song of Myself," "The Sleepers," "There Was a Child Went Forth," and "I Sing the Body Electric" are the best known today. In these Whitman turned his back on the literary models of the past. He stressed the rhythms of common American speech, delighting in informal and slang expressions. The first edition of Leaves sold poorly. Fortunately, Whitman had sent Ralph Waldo Emerson (1803–1892) a free copy, and in his now famous reply, Emerson wrote: "I find it the most extraordinary piece of wit and wisdom that America has yet contributed.… I greet you at the beginning of a great career." Emerson's enthusiasm for Leaves of Grass was understandable, for he had strongly influenced the younger poet. Whitman echoed much of Emerson's philosophy in his preface and poems. Emerson's letter had a profound impact on Whitman, completely overshadowing the otherwise poor reception the volume received. For the second edition of Leaves of Grass (1856), Whitman added twenty new poems to his original twelve. With this edition, he began his lifelong practice of adding new poems to Leaves of Grass and revising those previously published in order to bring them into line with his present moods and feelings. Also, over the years he was to drop a number of poems from Leaves. Among the new poems in the 1856 edition were "Crossing Brooklyn Ferry" (one of Whitman's masterpieces), "Salut au Monde!," "A Woman Waits for Me," and "Spontaneous Me." Most of the 1855 preface he reworked to form the nationalistic poem "By Blue Ontario's Shore." Like the first edition, the second sold poorly. The third edition of Leaves (1860) was brought out by a Boston publisher, one of the few times in his career that Whitman did not have to publish Leaves of Grass at his own expense. This edition, referred to by Whitman as his "new Bible," contained the earlier poems plus one hundred forty-six new ones. For the first time Whitman arranged many of the poems in special groupings, a practice he continued in all later editions. The most notable of these "groups" were "Children of Adam," a gathering of love poems, and "Calamus," a group of poems celebrating the brotherhood and comradeship of men, or, in Whitman's phrase, "manly love." Soon after the outbreak of the Civil War (1861–65; a war between regions of the United States in which Northern forces clashed with those of the South), Whitman went to Virginia to search for his brother George, reported wounded in action. Here Whitman experienced the war firsthand. He remained in Washington, D.C., working part-time in the Paymaster's Office. He devoted many long hours serving as a volunteer aide in the hospitals in Washington, ministering to the needs of the sick and wounded soldiers. His daily contact with sickness and death took its toll. Whitman himself became ill with "hospital malaria." Within a few months he recovered. In January 1865 he took a clerk's position in the Indian Bureau of the Department of the Interior. The impact of the war on Whitman was reflected in his separately published Drum-Taps (1865). In such poems as "Cavalry Crossing a Ford," "The Wound-Dresser," "Come Up from the Fields Father," "Vigil Strange I Kept on the Field One Night," "Sight in Camp in the Daybreak Gray and Dim," and "Year That Trembled and Reel'd Beneath Me," Whitman caught with beautiful simplicity of statement the horror, loneliness, and anguish caused by the war. Following the Civil War and the publication of the fourth edition, Whitman's poetry became increasingly preoccupied with themes relating to the soul, death, and immortality (living forever). He was entering the final phase of his career. Within the span of some dozen years, the poet of the body had given way to the poet of internationalism (not concentrating on a single country) and the cosmic (relating to the universe). Such poems as "Whispers of Heavenly Death," "Darest Thou Now O Soul," "The Last Invocation," and "A Noiseless Patient Spider," with their emphasis on the spiritual, paved the way for "Passage to India" (1871), Whitman's most important (and ambitious) poem of the post–Civil War period. In 1881 Whitman settled on the final arrangement of the poems in Leaves of Grass, and thereafter no revisions were made. (All new poems written after 1881 were added as annexes [additions] to Leaves. ) The seventh edition was published by James Osgood. The Boston district attorney threatened prosecution against Osgood unless certain poems were removed. When Whitman refused, Osgood dropped publication of the book. However, a Philadelphia, Pennsylvania, publisher reissued the book in 1882. In his last years Whitman received the respect due a great literary figure and personality. He died on March 26, 1892, in Camden, New Jersey. 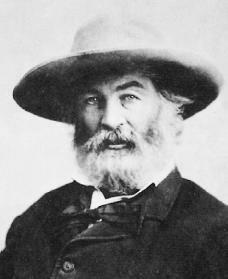 Leaves of Grass has been widely translated, and Whitman's reputation is now worldwide. Allen, Gay Wilson. The Solitary Singer: A Critical Biography of Walt Whitman. New York: Macmillan, 1955. Reprint, Chicago: University of Chicago Press, 1985. Loving, Jerome. Walt Whitman: The Song of Himself. Berkeley: University of California Press, 1999. Reef, Catherine. Walt Whitman. New York: Clarion Books, 1995.